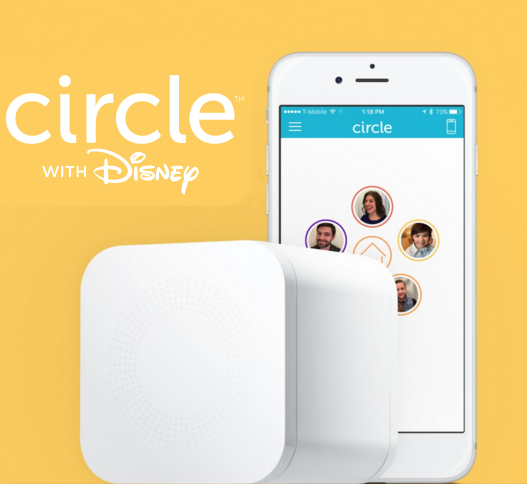 You may have seen advertisements for new product from Disney called Circle recently on Facebook, Twitter, etc. I was intrigued by a promo video I saw. After some research, I was even more intrigued with what it had to offer. I tried Circle at my own home to see if it was a viable answer for parents who are looking for ways to filter the internet at home. Here’s my Circle review. Set time limits for use on each device (iPad, laptop, video game console) etc. Set “bedtimes” that prevent kids from accessing the Internet after that time. Filter the content of the internet by child or device. Pause the Internet by device or by child. Get a better idea at what your kid(s) are doing when they are on the device. You can see what sites they go to, how much time they spend online, etc. Overall, the setup for Circle is easy for the most part. For tech savvy parents, this will be a breeze. If you are not as savvy, you may want to invite a “techie” friend over to help you get this setup. You take it out of the box, plug it into the wall, and then download the Circle App on your phone. You also have the ability to do the setup from your home computer as long as it is connected to your wireless network. When you open the app, you’ll be asked to join a new wireless network in order to get Circle setup. The app then guides you through the rest of the setup. From there, you’ll create a profile (a group of settings) for each one of your children. Finally, you assign device(s) to each kid and you’re ready to go. Circle allows you to set quite a few options for each child and the devices associated with them. Filters: For starters, you can choose to set a filter level: Pre-K, Kid, Teen, and Adult. Each level automatically filters out predefined content based on age level. Once a level is set, you can elect to filter out additional web sites based on categories such as blogs, games, social media, and music. Circle also provides you with a custom filter at the bottom of the screen. The custom filter allows you to create a list of specific web sites that you want blocked. Finally, from the filtering screen, you also have the ability turn on or off access to list of platforms such as Netflix, Minecraft, and YouTube. One thing to note though is that no web filter is 100% perfect. The custom filter is the best way to ensure your child does not have access to a particular web site. Time Limits: Circle does a fantastic job providing parents the ability to set time limits on screen time. Parents can set a daily time for each child in their profile. Once the time limit is reached, internet access to the device is shut down. There’s even a web page the kids can access that let them know how much time they have remaining. This is such a great feature because they aren’t asking mom and dad “how much time” every five minutes. You can also choose to limit individual applications as well. For example, you can set a daily time limit of 90 minutes and then restrict YouTube to only 15 minutes. Similar to the content filter, you can also choose to set time limits based on web site categories. Bedtime: Parents can use the bed time setting to set “awake” and “bed time” options. When the device is outside of those times, it simply won’t get online. So for example, if bed time is set to 7:00pm, the computer, iPad, or tablet will not access anything on the Internet after that time. It won’t regain access to the web again until the following day at the “awake” time. Based on MAC address, so it is really difficult for kids to get around it. Even really tech savvy teens will struggle to bypass this filter. Circle’s design with profiles allows parents to filter individual children instead of a “blanket” filter that applies all the restrictions to every computer in the house. It also gives parents the freedom not to filter their own devices such as work laptop or smart phone. You can access the controls from your phone, even if you are not at home. Circle doesn’t handle shared devices well. For example, it’s hard to apply the time limit feature to a family iPad that used by multiple children because the time limit doesn’t know who is using the device. Doesn’t filter out ALL apps on a device. If the app doesn’t require the internet to work, it will run just fine regardless of the restrictions. Currently, setup and management of Circle’s settings requires an iOS device running iOS 8 or later. An Andriod app is in the works. I am a firm believer in teaching, not blocking. In my opinion, nothing takes the place of good ol’ fashion parenting. However, Circle is a great solution for parents who would like to impose limits in this digitally rich world. With its ease of use and child specific settings, Circle is a powerful solution at an affordable price. I hope you enjoyed this review of Circle. If you have questions or you have comments to add to the Circle review, please do so below. I’d love to hear your thoughts and experiences.